Amalia Pallares is a professor and director of the Latin American and Latino Studies Program at the University of Illinois at Chicago. 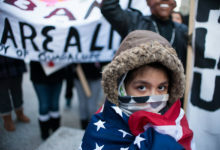 Her latest book "Family Activism: Immigrant Struggles and the Politics of Non-Citizenship" focuses on the undocumented immigrant activism in Chicago. Creating policies that help Deferred Action for Childhood Arrivals recipients thrive would benefit us all, not just the undocumented.